Stemming from the project which has made important progress in collaboration with the Mapuche community, Viña San Pedro was awarded first place in the “Human Rights” category from the last study from SIPP (Global Pact Principle Integration System , Sistema de Integración de los Principios de Pacto Global). Viña San Pedro has proven to be a benchmark for the wine industry, drawing both national and international attention with its “Buchahueico” project. 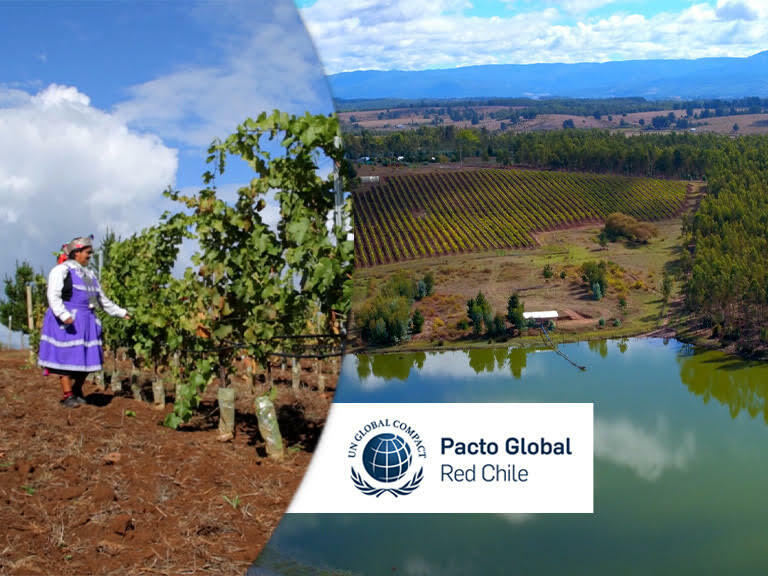 This entailed construction of the largest Chilean vineyard in collaboration with the Buchahueico Mapuche community in Malleco, making it worthy of this important acknowledgement. The group received first place in the “Human Rights” category, an acknowledgement awarded by the United Nations (UN) in conjunction with the Global Pact Principle Integration System. Its aim is to promote corporate management of different companies, associations and organizations. The study carried out this year by SIPP concluded that companies adhering to the Global Pact demonstrated integration of the ten principles. Viña San Pedro has consistently stood out as a result of its innovative, sustainable initiatives which contribute to the development of the industry and the wellbeing of the community, a spirit which is thoroughly reflected in this project. “We are very excited to receive this top-level acknowledgement for this project carried out with families from the Buchahueico mapuche community. It has demonstrated that it is possible to construct an associative, replicable and sustainable model, capable of generating new economic and social development opportunities in the region. It has given them the opportunity to work and to cultivate their own lands sustainably through collaborative work, in which human capital and land are harnessed –and these are the main inputs for the wine production process”, says Bárbara Wolff, Corporate Affairs Manager at VSPT Wine Group. The first harvest of the vineyard will be carried out in March this year, demonstrating that this plan –of great social depth– has managed to positively incorporate the mapuche community into the wine industry. Commitment and collaboration with the mapuche families in the region have enabled the production of a Pinot Noir with unique characteristics. This important acknowledgement for Viña San Pedro is a reflection of the hard work from a great team of associates, who are committed to developing sustainable initiatives, which contribute to the development of the industry, society and a more harmonious management with regards to the environment.